Prohibition was repealed on 5 December, 1933, but not one legal drop of liquor was served in New Castle that night. Private celebrations involved bathtub gin, bootlegged whisky from Canada or the moonshine that was locally referred to as Moravia Street bourbon, as nowhere in town was licensed to sell alcohol. That week, the state bought the old C Ed Smith Furnace Company workshop on Produce street, on the east side, and commissioned workmen to convert it into New Castle’s first state liquor store. A month later, the building had been transformed into an edifice with “the neat appearance of a well kept penitentiary.” The windows were protected with steel bars, five-eighths of an inch thick; the glass was wired to set off an alarm if broken; and entry to the establishment could be prevented by the formidable, reinforced door. Plain gold letters across the front of the building read simply, “Liquor Store Pennsylvania Liquor Control Board”. The state had decided to tolerate the sale of liquor, not encourage it, and the liquor store was not supposed to be a pleasant place to visit. Nevertheless, in the two hours for which it was open on its first night of business—Saturday, 6 January, 1934—it sold more than $1,000-worth of liquor to around two hundred and fifty customers, serving one customer every thirty seconds. Soon, sales settled down to a healthy rate of around $1,100 a day—all in cash, as it was illegal to buy liquor on any sort of credit. Thomas Herovich had been sent to jail for eight years in the twenties for an armed robbery in Springfield, Ohio. He was released in the middle of the depression, not long after the Wall street crash—a middle-aged ex-convict with no trade. Naturally, he returned to his previous profession and was soon wanted by the police in connection with the robberies of a bank in Columbiana, a theater in Sharon and a club in Farrell. The liquor store was robbed several more times in the years that followed. The biggest haul was taken in 1947, when two masked bandits armed with pistols escaped with $1,263. By the end of the thirties, three more state liquor stores had opened in New Castle, all in far better locations. The Produce street store eventually became the area’s liquor warehouse and was closed down in 1973, with all operations being transferred to Pittsburgh. All the buildings on the street were demolished not long after, and the area is a now a parking lot. 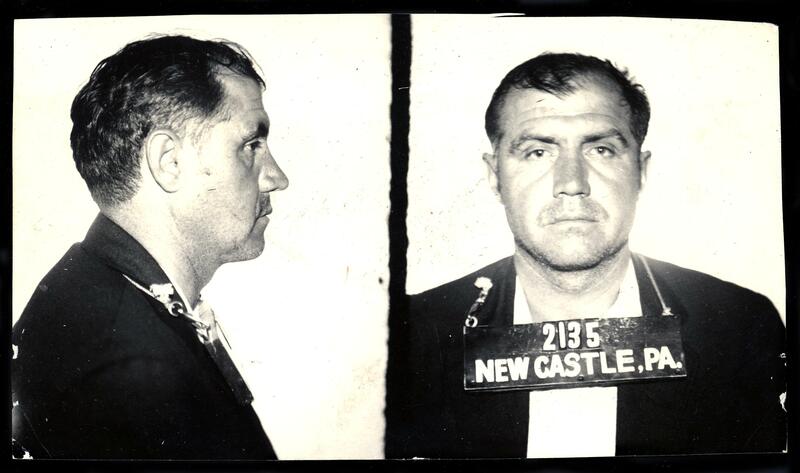 Sources: New Castle News (23 Dec 1933 “State Liquor Store Being Made Ready”; 8 Jan 1934 “State Liquor Store Is Open”; 20 April 1936 “New State Store Will be Opened”; 1 July 1936 “Suspect Admits He’s Liquor Store Robber”; 13 July 1936 “Liquor Store Bandit Surrenders”; 20 July 1936 “Third Suspect In Liquor Store Robbery Taken”; 29 July 1936 “Liquor Store Bandits Given Prison Terms”; 1947 April 14 “State Liquor Store Held Up”; 22 Jan 1973 “State Liquor Warehouse Will Close”).